A middle aged empty nester searching for diversions, photo ops, and free snacks. It’s been awhile since I checked out one of Fredericksburg’s old-time eateries. 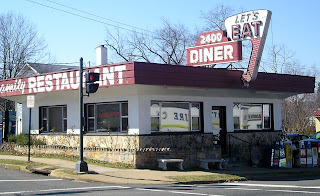 The 2400 Diner is a tiny treasure that’s been around since 1950, and is still popular with the locals. My husband and I used to stop in for a big breakfast in the old days, on those rare occasions when the kids had school on some minor holiday that he and I had off from work. The homefries were always my favorite part of the breakfast. But I haven’t been there in years, so when a friend suggested we get a bite there one Sunday morning, I jumped at the chance. Nothing much has changed over the decades, and the breakfasts are still a big attraction. With only a handful of booths and a few stools at the counter, there’s often a wait during busy times, but the weather was warm, and we chatted outside while we waited for a table. 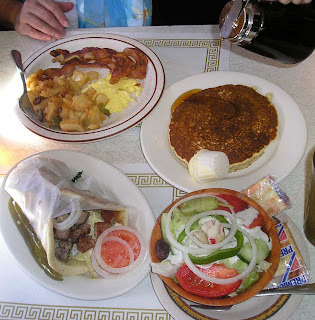 We covered a few of the culinary bases by ordering a hearty breakfast and a classic Greek gyros on pita with a salad. The menu features all of the usual diner offerings, and the free coffee and iced tea refills keep coming. For some beautiful photos of the diner, check out this gallery by local photographer Rich Mason.